Spotify songs are in the original OGG Vorbis format with DRM protection which prevents you from downloading and distributing them elsewhere for enjoyment. 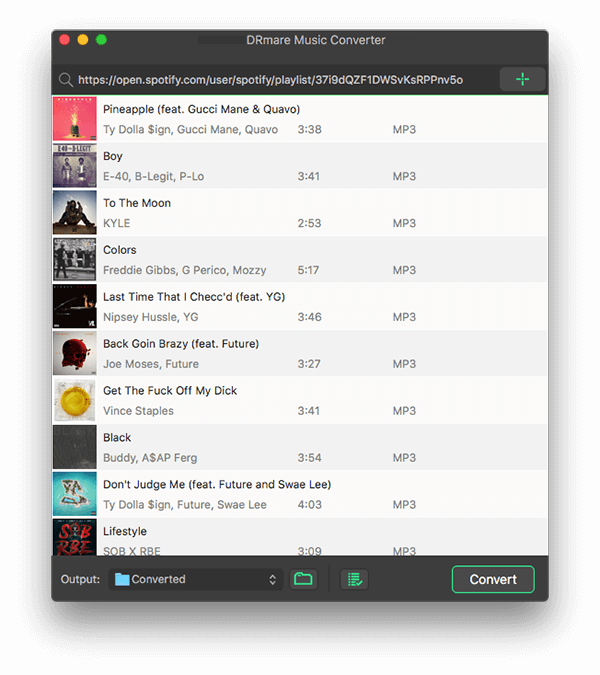 Thanks to the well-designed DRmare Spotify Music Converter for Mac, you can now batch download Spotify tracks as MP3 and other formats for playing on your local devices effortlessly. 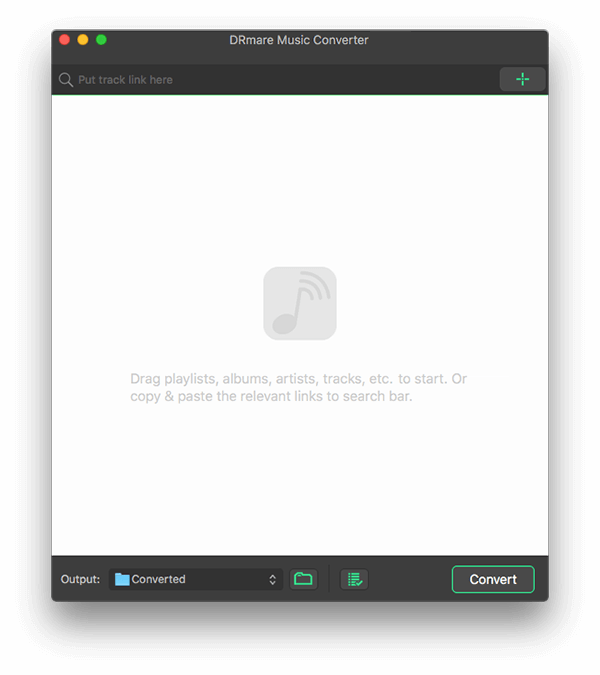 To get started, please install the free trial version of DRmare Spotify Music Converter on your Mac by dragging the software package into the Application folder. After that, you can double click the software icon to launch it. You will see the sleek and intuitive screen as below. Note: DRmare program depends on the official Spotify app to run, please make sure it is installed on the system as well. It will be opened together with the DRmare software. There are two ways to add Spotify songs to DRmare Spotify Music Converter. 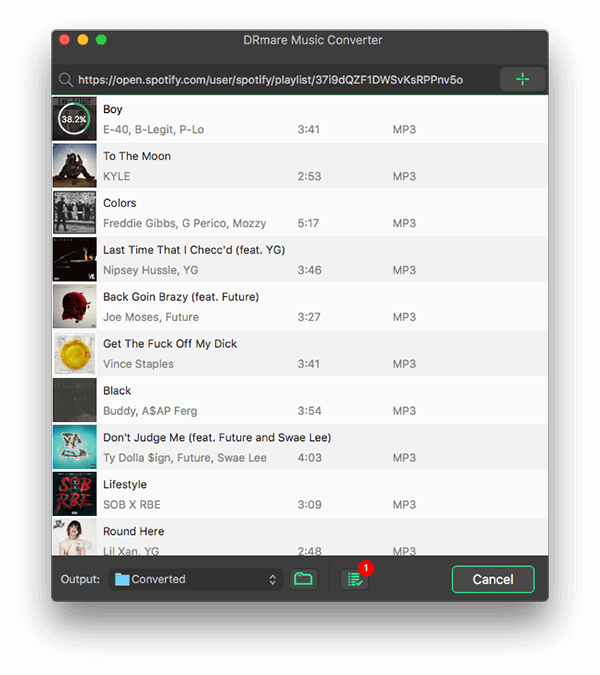 The most direct way is to drag and drop the songs, albums, playlists, or artists from the Spotify app interface to DRmare program conversion window. The other way is to right click on the Spotify item, choose 'Copy URL' and then paste the link to the DRmare search box and press '+' button. DRmare supports the Spotify free account well, you don't have to subscribe to the Premium service. DRmare has defined the most popular settings by default such as the MP3 output format. It should work perfectly for most users. But if you are an advanced user who has specific requirement about the new music, you can also go to the 'Preferences' window to change the format, channel, sample rate, bit rate, output folder and sort the music by artist/album etc. For stable conversion, you are highly suggested to set the conversion speed as 1X instead of 5X. 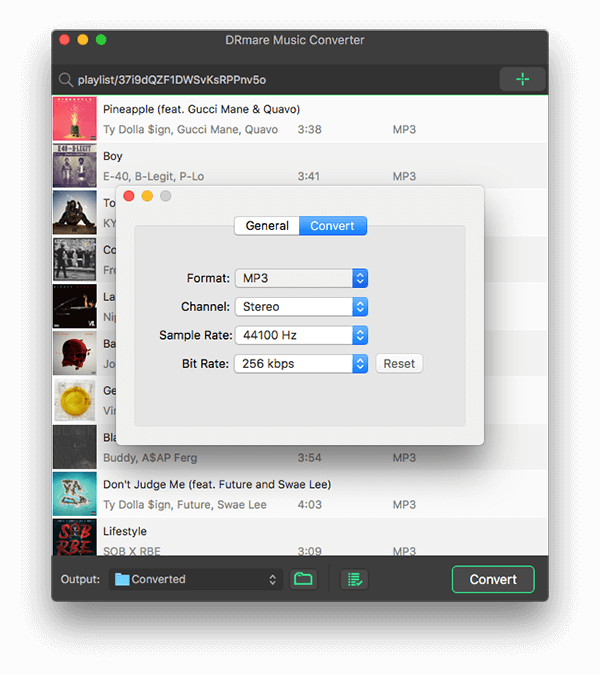 At last, you can click the 'Convert' button to start downloading the Spotify tracks you have imported to MP3 or other common audio formats as you like. After converting, you will get all the downloaded songs on your selected folder with no DRM protection.